“The most comprehensive measurement of glaciers worldwide found that thousands of inland masses of snow compressed into ice are shrinking 18% faster than an international panel of scientists calculated in 2013,” The Associated Press reports, citing a study by the World Glacier Monitoring Service in Zurich, published this week in the journal Nature. Overall, “the world’s glaciers are shrinking five times faster now than they were in the 1960s,” AP notes. “Their melt is accelerating due to global warming, and adding more water to already rising seas.” The hardest-hit regions, with average ice mass loss of more than 1% per year, include central Europe, the Caucasus region, western Canada, the Lower 48 U.S. states, New Zealand, and near the tropics. 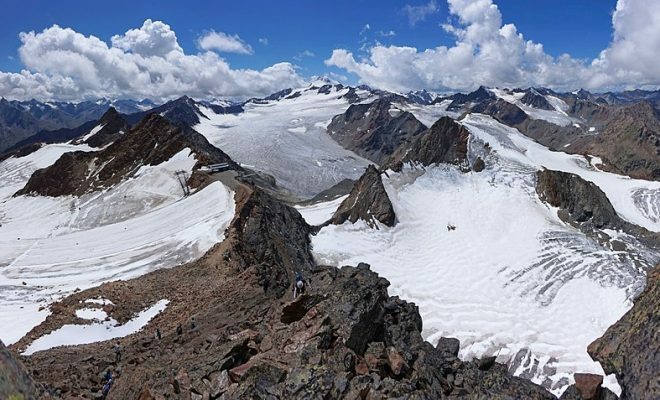 “Glaciers in the European Alps and their recent evolution are some of the clearest indicators of the ongoing changes in climate,” said study team member and ETH Zurich glaciologist Daniel Farinotti.The Guardian coverage refers to a study earlier this year that showed the Himalayas losing one-third of their glacier ice by 2100 in the best-case scenario for GHG emissions. Late last year, Canada’s first-ever State of the Mountains report concluded that Alberta, British Columbia, and Yukon could lose up to 80% of their mountain glaciers over the next half-century, as rapid warming brings a combination of less snow and accelerated melting.